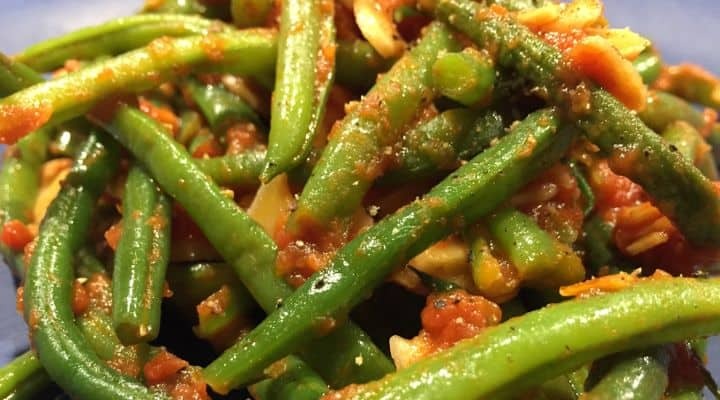 Looking for a unique and delicious Paleo and SCD green beans recipe? The addition of the toasted almonds and cooked tomatoes in this recipe makes for a much more filling version of this dish, great as an entree on it’s own. It’s also a quick meal to throw together, using only a single skillet that has to be washed later. 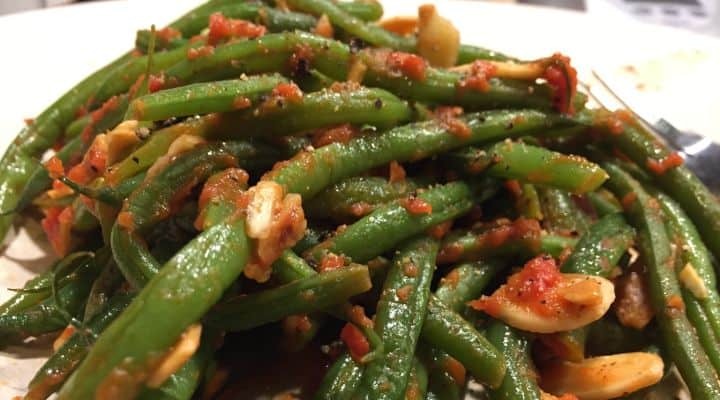 It’s a good choice as a thanksgiving main dish or side as well to really elevate the traditional Thanksgiving green beans with almonds to another level. Although we’ve been focusing recently on our article series on SCD legal packaged foods and delivery, Whole30 meal delivery services and the best Paleo meal kit, we love to also share some of our favorite recipes. 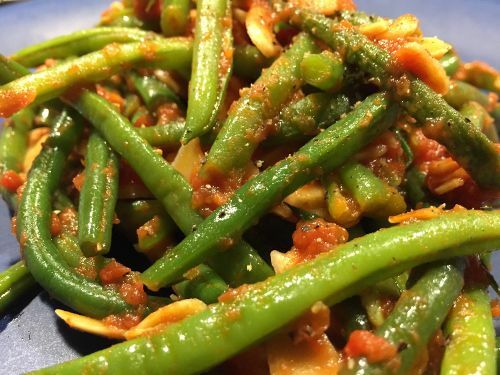 This Paleo SCD green beans recipe has become one of my go-to dishes over the last couple of years. 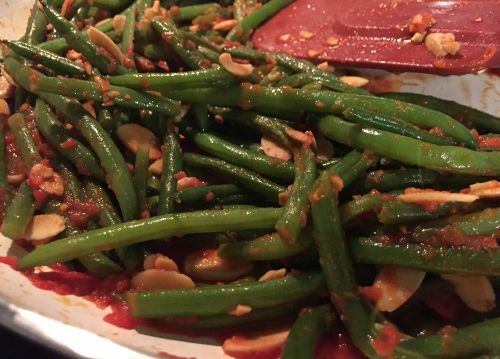 I love how the combination of 3 simple ingredients, toasted almonds, butter and tomatoes combine together to coat the string beans and really form a decadent sauce for the dish greater than the sum of the parts. Although there is some debate in the Paleo community about whether string beans or haricots verts should really be part of a Paleo eating plan. Many let it pass based on the ratio of pod to bean, similar to sugar snap peas. Given my background on the SCD diet it just seemed natural to include green beans as part of a grain free eating plan. I eat this dish as my main entree often on busy evenings after work. It’s quick, requires minimal prep – especially if you use pre-washed pre-cut haricots verts and canned tomatoes and there is just a single skillet to clean after you are done. I’d highly recommend giving it a try. Prep and wash the haricots verts (or string beans). Trader Joes sells a pre-washed/prepped bundle of haricots verts in our area that can save some time. Wash and slice the cherry tomatoes in half if using fresh tomatoes. We sometimes use Italian diced canned tomatoes (pictured) as a time saver on a weeknight, although the fresh cherry tomatoes do add another dimension to the dish. We like the Mutti brand imported from Italy for canned as Italian tomatoes by law cannot include canning ingredients not on the label and there is a noticable different in the taste of these tomatoes. Finally, add the green beans, tomatoes and toasted almonds to the pan along with a few pinches of sea salt and cook until the green beans are tender, to taste. Stir occasionally to prevent burning.